F & M, N – The symbol / mark of Felsenstein & Mainzer, Nurnberg. 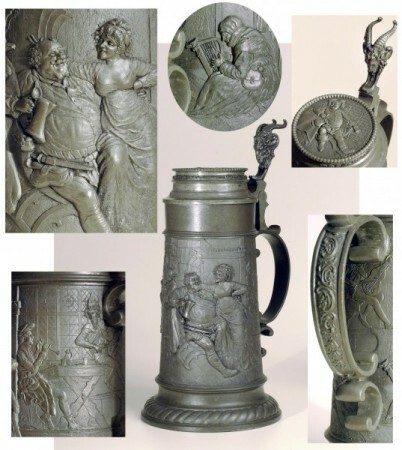 A well known pewter stein and pewter beaker production company. 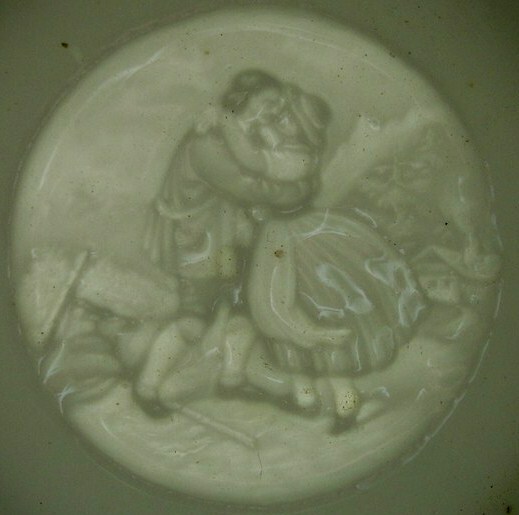 Shown above: Relief scene of the old knight Falstaff with Miss Quickley, drinking from a German pewter beer server! Shown: Their mark in the center of a distributor’s name. 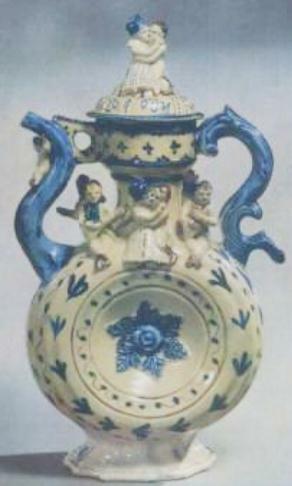 Another of the same series by F & M, N. This one with a Bacchanalian scene (showing Silenus on the front (and with the same lid and thumblift as above. I believe there are at least two more scenes in this set. [Full] Face stein – Shown: Pretty much self explanatory. Below ▼ another. Both in nice heavy relief. 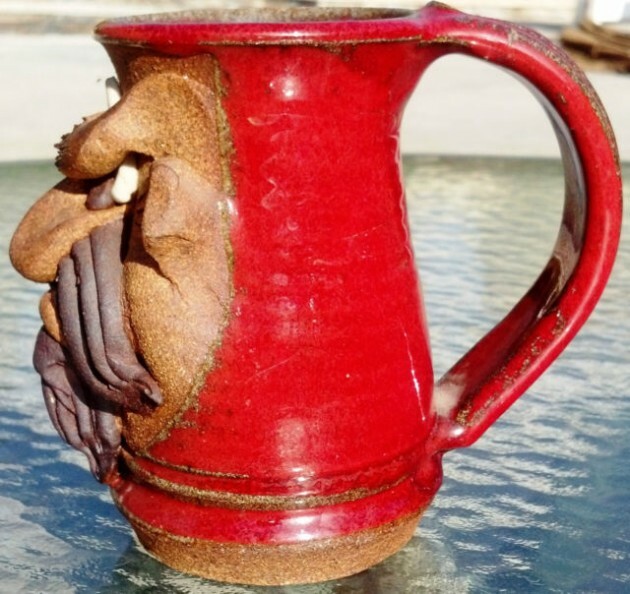 Face Jugs (USA) – “Down in rural North Carolina there use to be a thriving moonshine industry and since in rural North Carolina lies the little pottery crazed town of Seagrove there was bound to be a connection between Moonshine and Pottery. 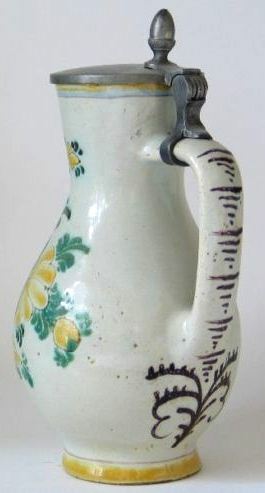 Now Seagrove doesn’t claim to be the first to make the face jug but it does have its place in the face jug history. 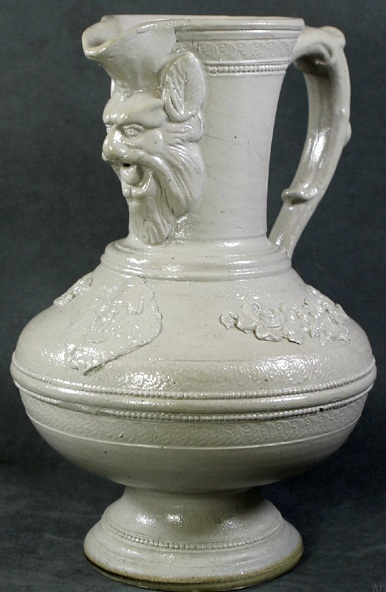 There are many tales behind the face jug so let me share the two that I best know are true. 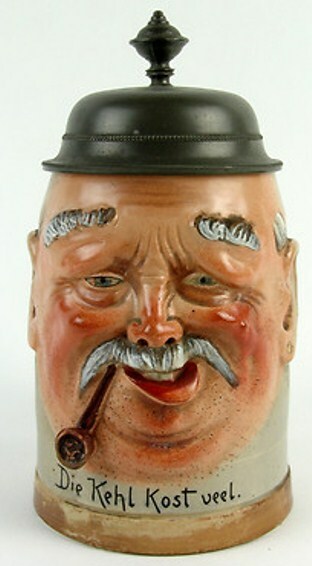 It is believed that the face jug was first created as both storage for illegal moonshine and a child preventative. Old Grandpa use to brew him up a batch of his finest moonshine and pour it into a devil or some other monster face jug and cork it. Now when the kids came round, grandpa would say, Kid’s now ya’ll don’t go in my bedroom, cause the Devil is in there. So in essence, grandpa got to drink his moonshine, hide it from the law, and scare the kids away from a gut wrenching. 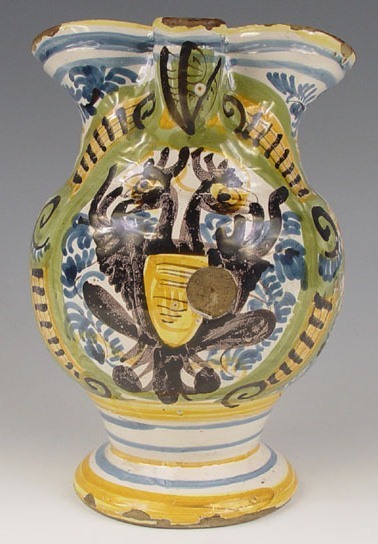 “Smiley” on the other hand is a happy version of a face jug, perhaps to lessen the anguish of cough medicine, or to serve drink, punch, or something pleasant from. 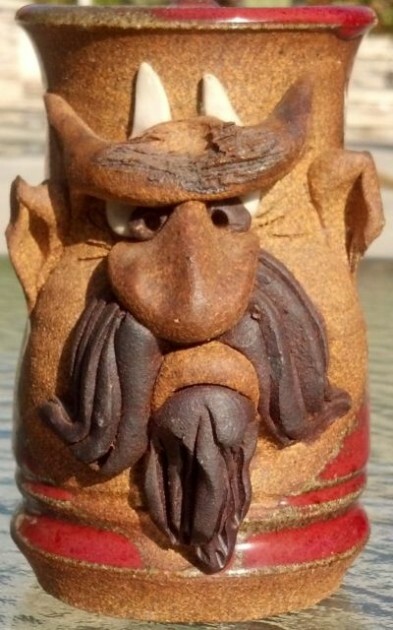 Face mug – ▲ A newer form of Southern American art work , probably based on the success of “Face Jugs.” A couple of USA examples by “MAHON” are here. Faust’s Own – An American brewery and oyster house located in St. Louis in 1871. It was owned by Tony Faust. 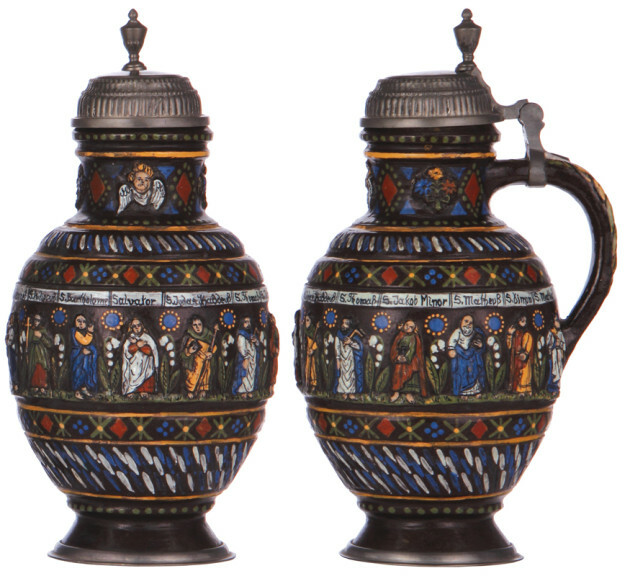 They ordered .5 liter porcelain steins from Rauenstein. A couple of versions can be found. Anthony Edward Faust, born in Germany in 1836, arrived here at age 17 as a plasterer. He opened a small tavern on Russell Boulevard in 1862 and, nine years later, moved to the northeast corner of Broadway and Elm (now site of the Stadium East Garage). An unusual menu specialty was quail on sauerkraut. Faust entertained with his live-crab test for personal checks. If a crab’s claw grabbed the check, he’d accept it. The fare included caviar, $1.50; lobster, $1.25; broiled duck, $1.20; a dozen oysters, 25 cents; gumbo chowder, 20 cents; custard pie, 10 cents. Visitors often proclaimed it the best food and atmosphere west of Delmonico’s in New York City. Louie, the headwaiter, gathered his staff and counted to three: “Eins, zwei, drei.” They serenaded diners with “Die Lorelei,” a mournful German ballad of a boatman dashed upon rocks. It matched their melancholy on June 30, 1916 — last call at Tony Faust’s Oyster House and Restaurant, Broadway and Elm Street. For more than four decades, Faust’s was the city’s premier place to eat and be seen. 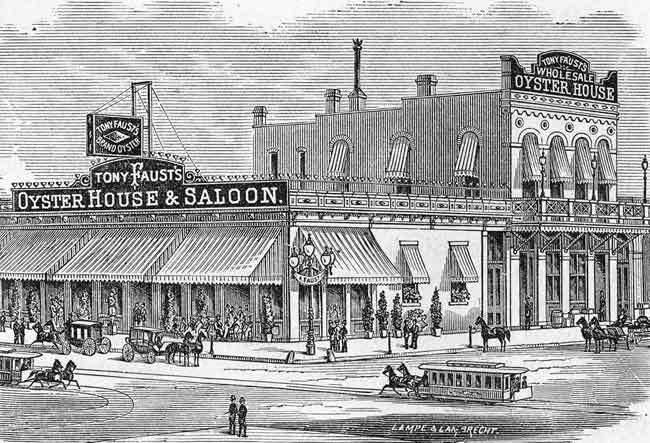 Tony Faust’s Oyster House and Restaurant, was at the southwest corner of Broadway and Elm Street, some time after he rebuilt following a fire in 1877 that began in the Southern Hotel next door and destroyed both buildings. The fire killed 21 hotel guests and employees. It also produced two heroes of the St. Louis Fire Department — Phelim O’Toole and Michael J. Hester, who scaled ladders to reach people trapped on the top floors of the Southern. Lithophane for above ▲. 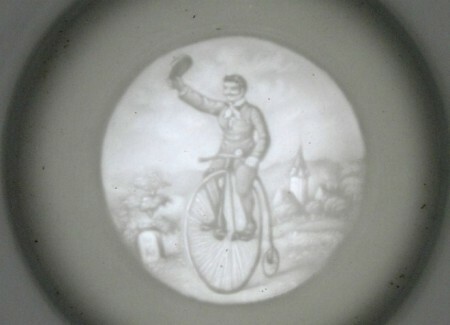 There was no stock lithophane as different ones have been seen such as the one below ▼in the identical stein body as the one above. 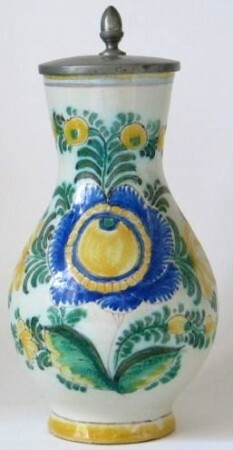 Fayence/ faience; Austrian steins – Typical Austrian pear shaped body. Flat pewter lid and acorn thumblift. 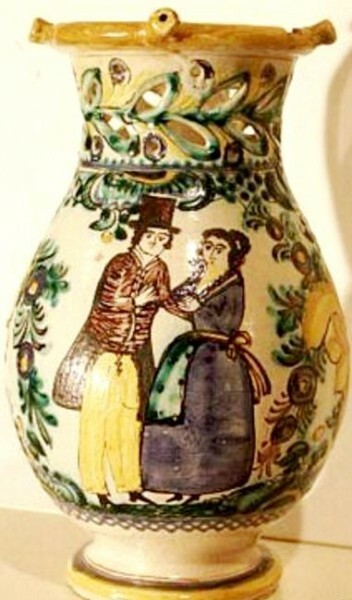 Circa 1840-60. 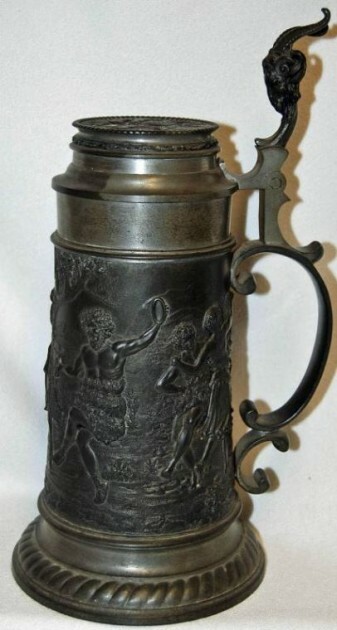 Fayence steins , German, – Fake (Faux)- Made sometime in the mid 1900’s (60’s to 90’s) these, not all , come with really terrible lid pewter work; indistinguishable maker’s marks on the lid; faux crazing; and a body style (pear shaped) not much seen in Old Germany per se. Photos blown up so hopefully one can see the crazing. 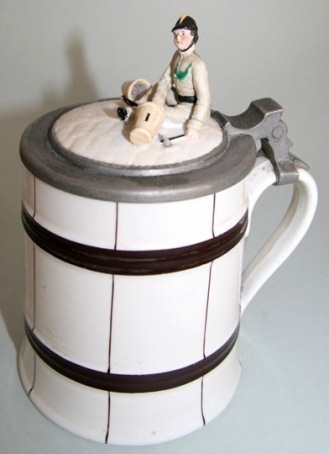 Some of these have been offered on eBay for 1000’s of bucks. Be VERY careful out there folks! 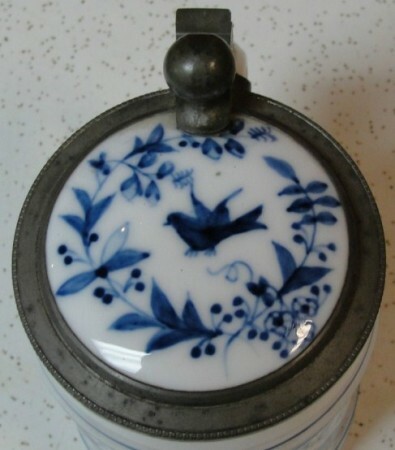 A piss poor quality molded lid and the marks are terrible too; besides being in the wrong location. 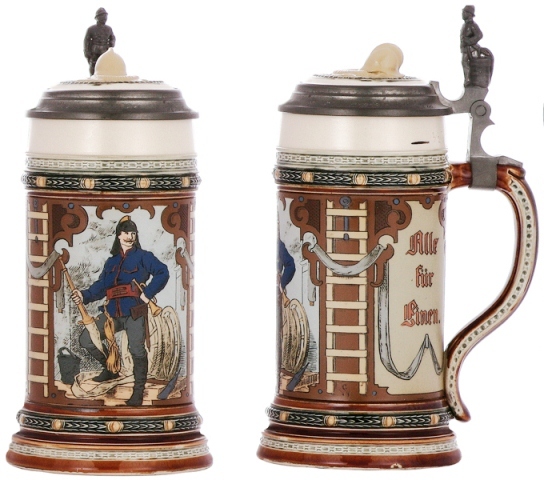 REST ASSURED THAT IF YOU SEE YOUR STEIN (OR ONE FOR SALE THERE ,)IT IS GUARENTEED BY ME TO ABOUT 99.5 % TO BE FALSE OR ONE MADE IN THE EARLY 1900’s . MANY OF THESE ARE PRETTY BUT NOT CONSIDERED “NOT TO BE THE REAL THING!” BY TODAY’S COLLECTORS. 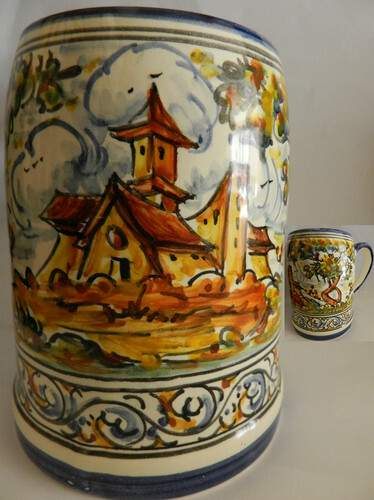 Fayence / faience; German steins -There are hundreds of cities / locations that produced Fayence beer steins (German spelling) for well over 100 years. 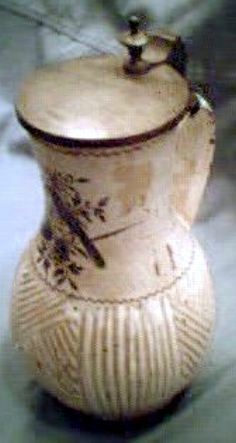 It is basically a tin glaze applied over a thin pottery shell. 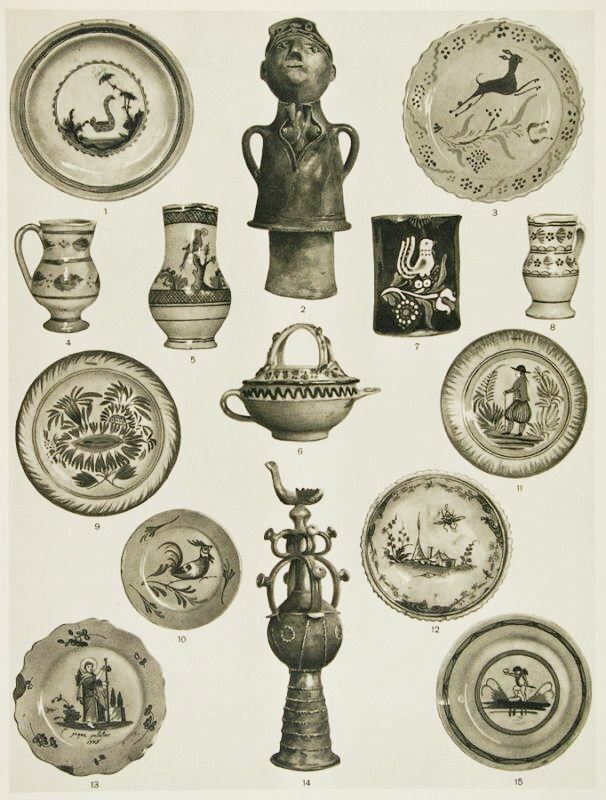 (See also Habnerware and Majolica.) 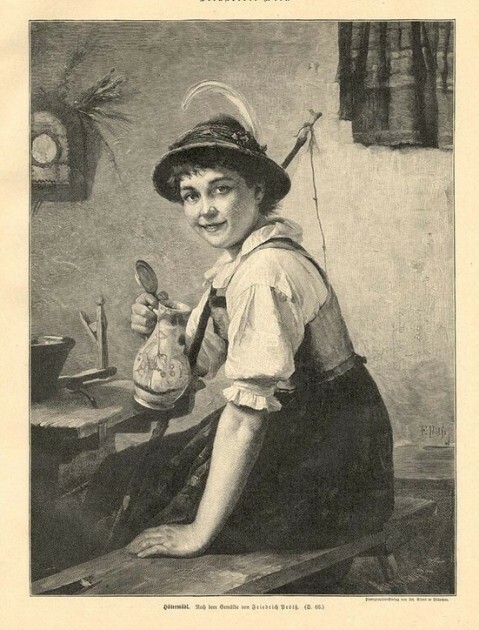 For more info about any type of fayence, I recommend you look under the “Stein Links” Tab and contact Mr. William Hamer. My friend Bill has forgotten more about Fayence than most collectors know! 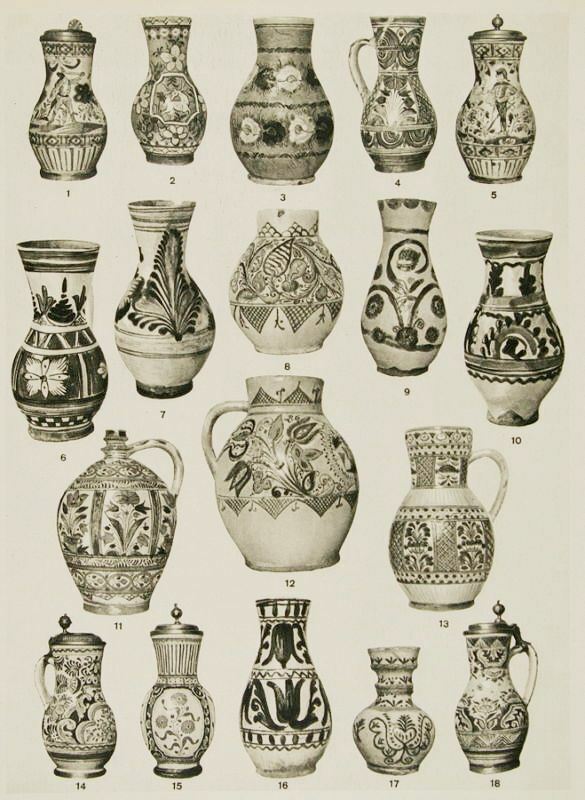 Fayence / faience; Hungarian steins – Very light weight coating and easily chipped compared to the standard German variety. 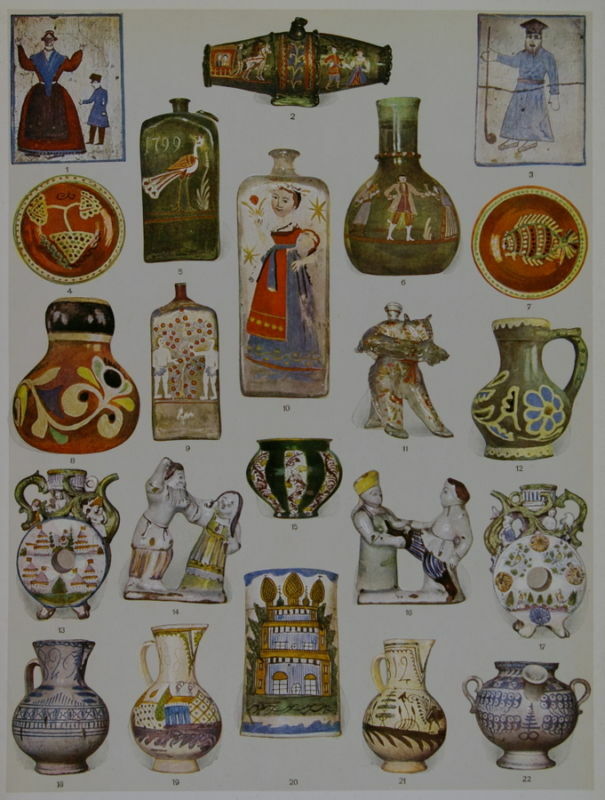 Fayence / faience Italian vessels – As Italy has thrived on the wine trade for centuries, there are very few steins that were ever made there. 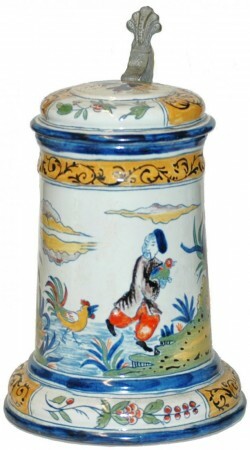 Shown: A nice (but badly chipped) Italian wine server. Ca. late 1700’s. 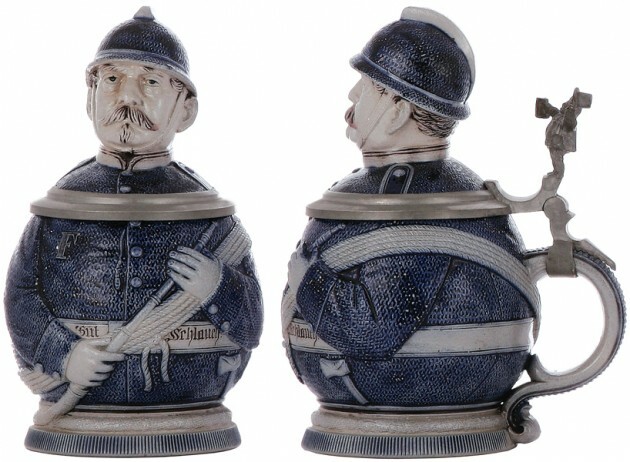 Fayence / faience – V & B Mettlach steins – The factory assigned the ‘5000 number series’ for these pieces that replicate fayence, but in fact are not. Watch for a full page on this series mid to late 2013. 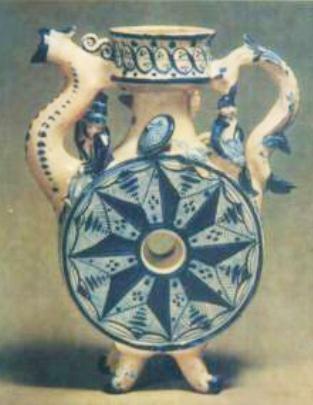 Fayence / faience: Russian – There are not many examples of steins found that can be documented as from Russia. 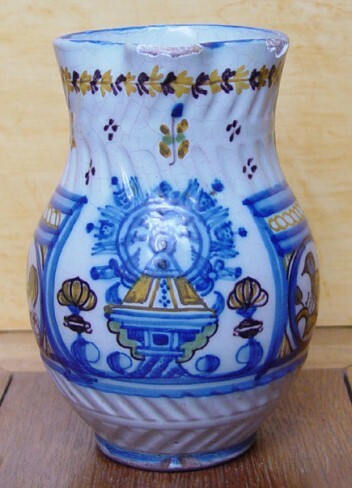 ▼ Two examples of Fayence serving vessels, very heavily Chinese influenced. 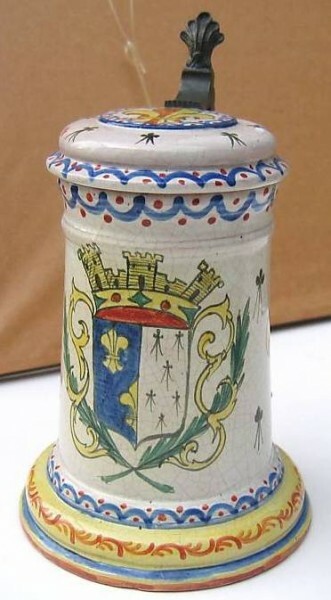 Fayence / faience; Slovakian steins – Slightly brighter / bolder colors than most old Hungarian, and lots of greens and blues as the Austrians. 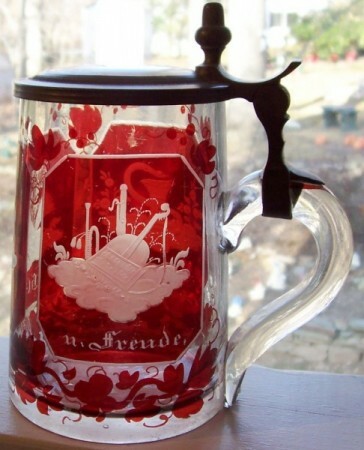 ▼ Next 3 Pictures: Fayence mugs and stuff from Austria, Hungary and Romania. ▼Fayence, probably Slovakian or Hungarian. Somewhat newer I think, say Circa 1900. 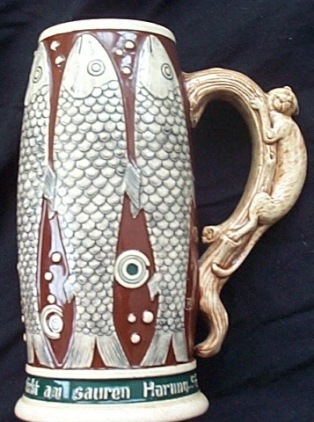 Fayence / faience; Spanish steins / mugs – Spain, the red wine country is not noted for it’s beer vessels production. 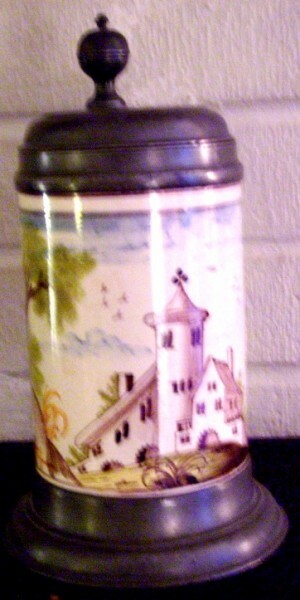 ▼A much newer Spanish hand made mug with building decor reminiscent of German Fayence from Braunschweig. 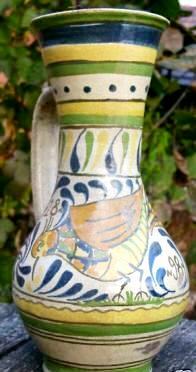 ▼ Small Fayence wine jug, Spanish [or Italian] – 6.5 inches. Mid 1800’s. 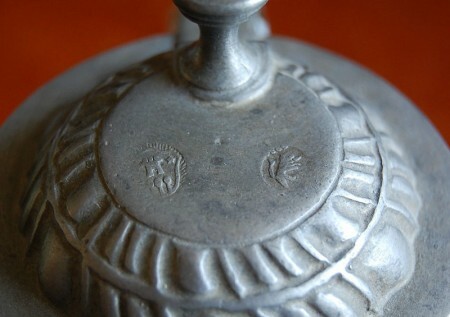 Feinzinn — A mark of high quality pewter. Fifteen eighty eight (1588) and Fifteen ninety nine (1599) – On lots of slip applied roundels. A date found on the Coats of Arms, on wine servers mostly. It is unknown to me what those dates signifies or who the Coats of Arms are for. Perhaps one of you readers could help me out? 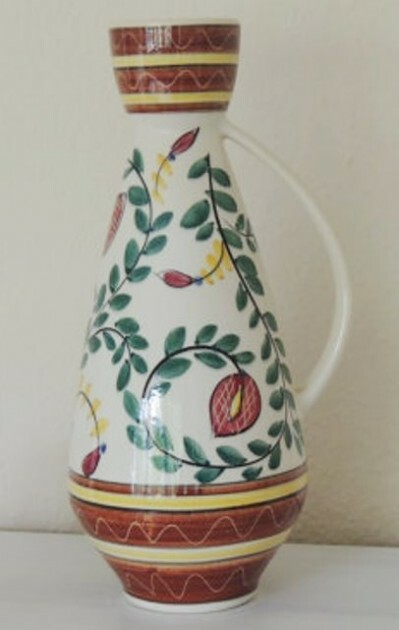 ▼ Double ring jug from R. Hanke in the Westerwald. 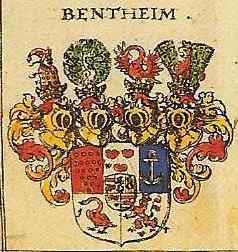 ▼The closest I have come to tracking down these Arms is thanks to a nice reader sending me this photo of this family: The Bentheims! Many of the sub -quarters are the same. Figurenkrug (Germ. ) – Character stein (Eng.). Filigree — Fine silver, gold or silver-gilt wires twisted and built up in curvilinear designs kept in place with solder applied at points of contact. 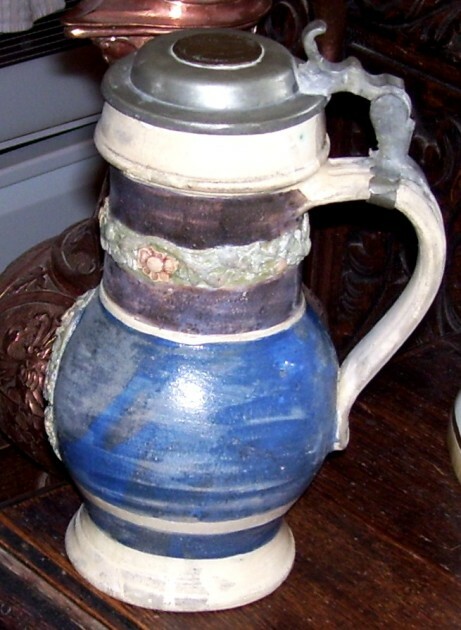 Fillet – A narrow, slightly raised band often used around the body of a tankard, mug, measure or flagon for decoration and to strengthen the cylinder wall. Also called a rib. 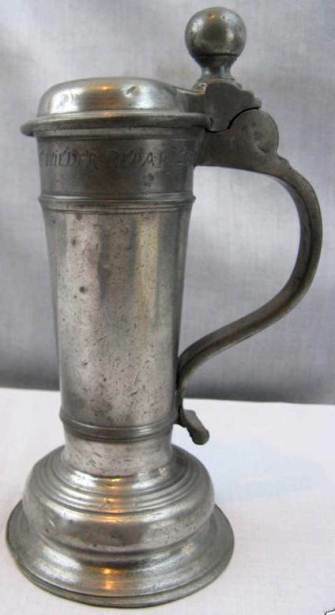 ▼A 9 inch, dated ‘1677’ pewter roerken with two fillets on its body. These are sometimes called “separator rings”, usually on glass items such as below ▼. 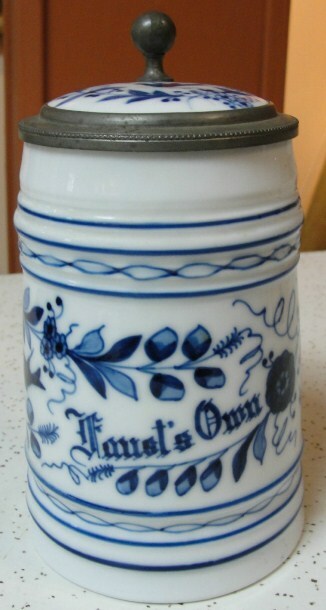 A very well done blown glass enameled German Roemer with separator rings and prunts in the middle of the stem. Most likely made by Lobmyer. This roemer is 11 inches tall. Circa 1900. Finger hooks- The small protrusions on a molded handle, mostly found on the stoneware steins and servers from the Westerwald and Regensburg sometime in the late 1800’s. It is not exactly certain what year or even in what decade these came into being. 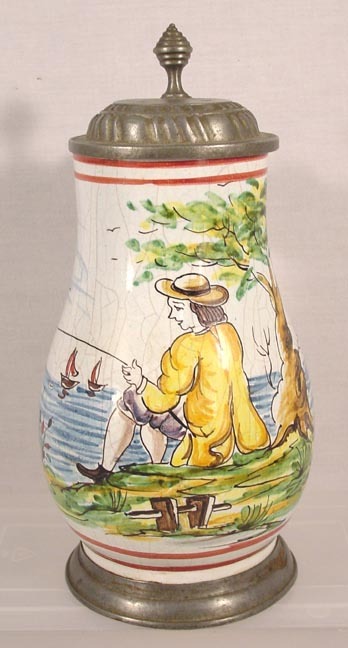 Small wine jug. Probably Regensburg. 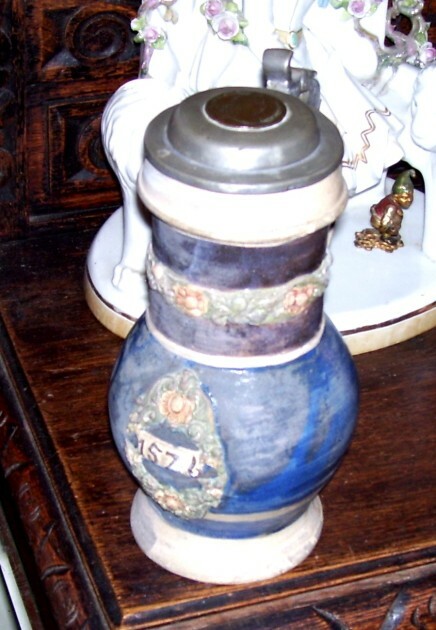 Finial — Top most feature of a piece, or centering the lid of a beer stein. Sometimes cast separately and often figural. 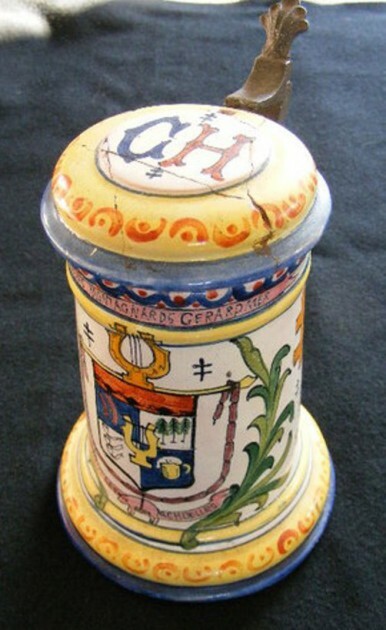 Shown: [A] On this stein the finial is the cast Ram’s body. 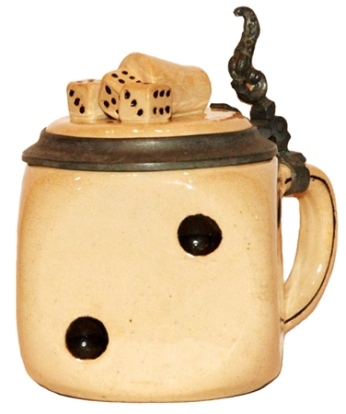 [FWTD]- [B] This finial of the cup and dice is cast as part of the lid. 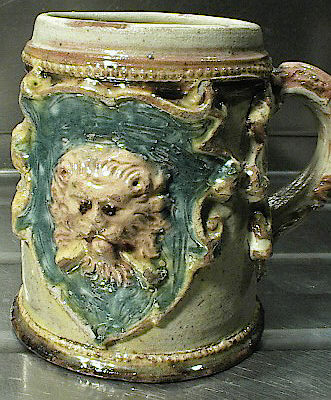 DANISH – PEG TANKARD LATE 1600’S. 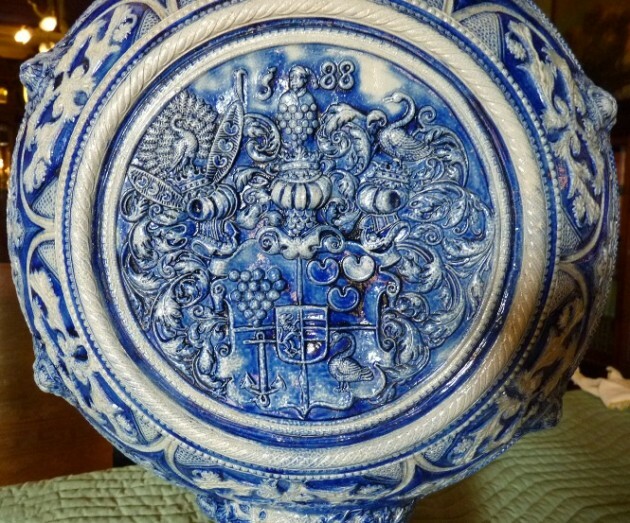 IF THE HANDEL’S FINIAL IS NOT DIRECTLY OVER THE BALL / CLAW FEET, THEN THE PIECE MIGHT WELL HAVE BEEN CONVERTED FROM A LIDDED BEAKER. 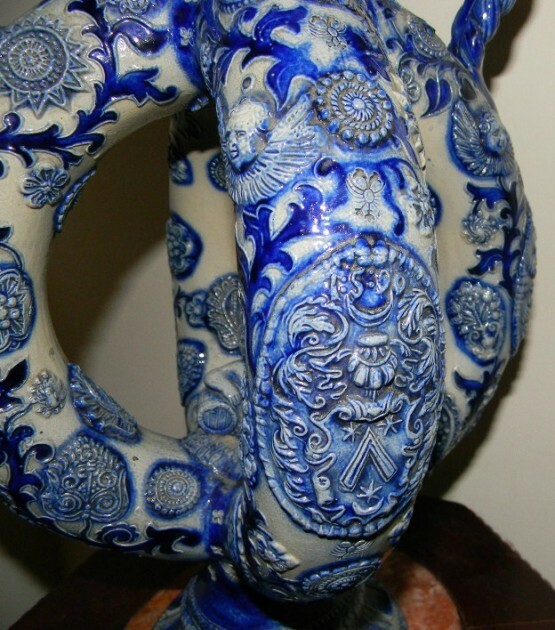 Finial, handle – The end section of the handle that is not attached to the body. 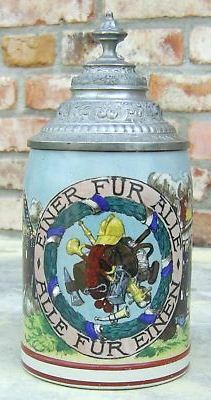 Most often seen on metal beer steins as a shield, heart. or a flatten relief medallion. 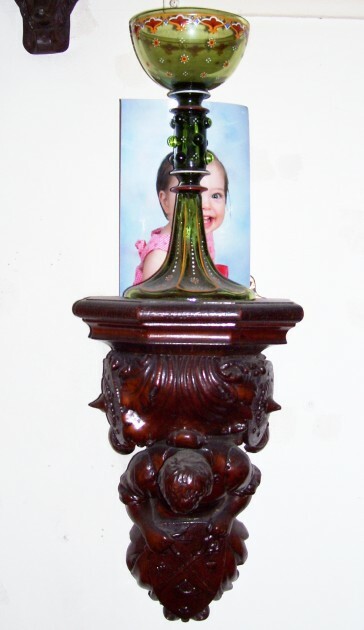 On old glass the twisted up finial is called a pig’s tail. 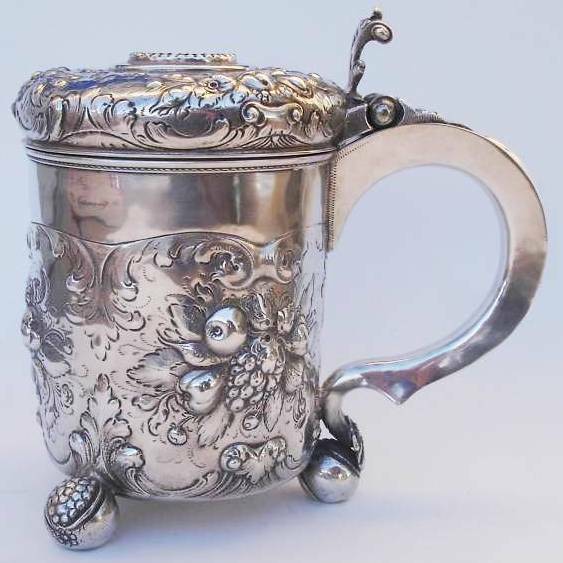 Shown: 1600’s silver stein from Denmark with a small “shield” handle finial. 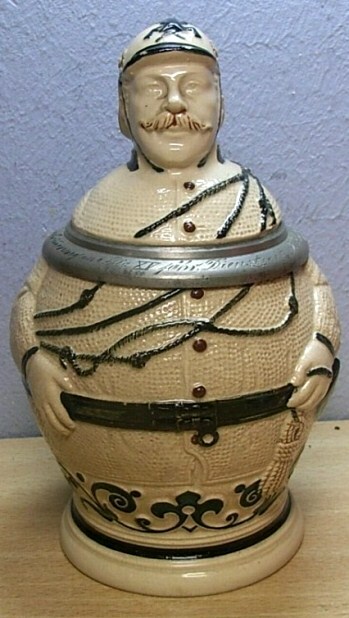 “ONE FOR ALL, ALL FOR ONE!” A .5 liter pottery, PUG, ▲showing the typical “Occupational” tools. 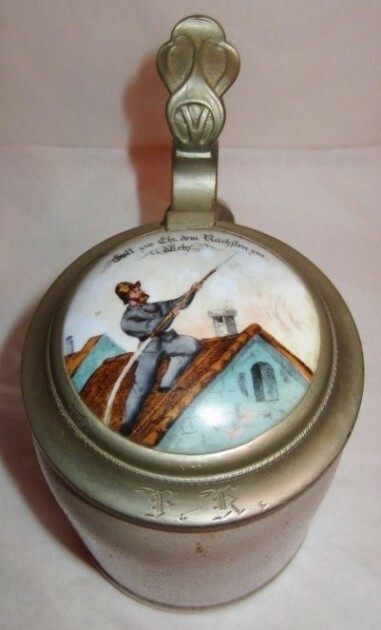 Perhaps the most sought after Fireman’s stein is this V & B, Mettlach stein, .5L, # 1724, incised, with an inlaid molded lid of a helmet. Fireplace /mantel steins (display steins) – Thin stamped copper items copied from steins .See: “Stein Myths” page , this web site. [FWTD] Also called and used for kindling, steins. 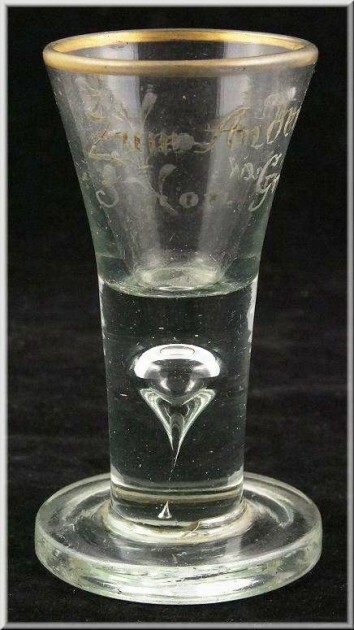 Firing glass – A small English after dinner = sherry or port wine glass with an extraordinary amount of glass on the base to keep it from breaking after the drinker slammed it down hard on the table…. making a loud noise which was said to sound like a gun firing! This would have been down at the end of a toast and if some speaker made a point that the audience liked = instead of clapping. [Steve’s speculation – these may also have been used at weddings ….similar to our custom of ringing a glass with a fork or knife signaling the newlyweds to kiss!! 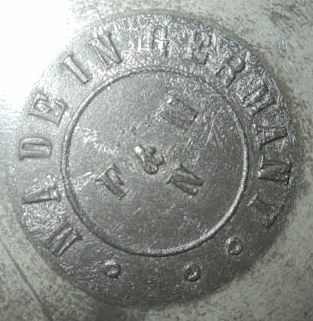 Five percent mark (5%) – very seldom found on pewter steins, that indicates there is no more than 5% lead in the pewter mix. 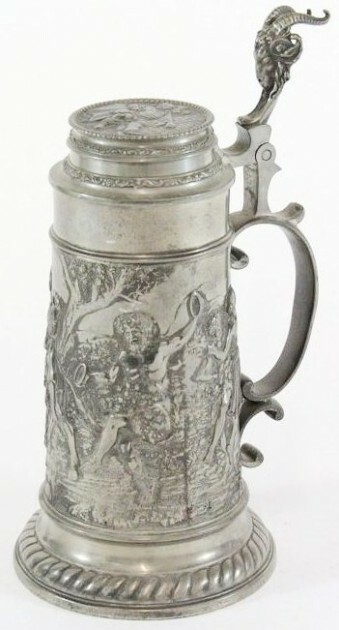 It is the opposite mark of the 95% mark which indicates the pewter is 95% with out lead.